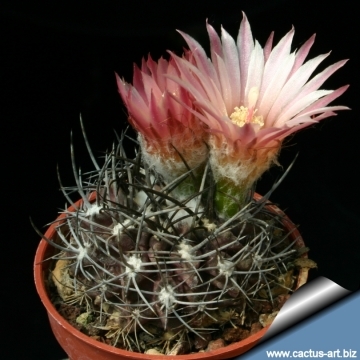 Origin and Habitat: Eriosyce curvispina is endemic to Chile, where it is found in Copiapó and Caldera, Atacama, Chile, south to the Rio Maule. Altitude: 0 to 2400 metres above sea level. Habitat: The species occurs in sclerophyllous forest on rocky areas. It is frequent but occurs mainly at low densities. (Densities of 10,000 individuals per km2 are estimated to occur on some slopes). 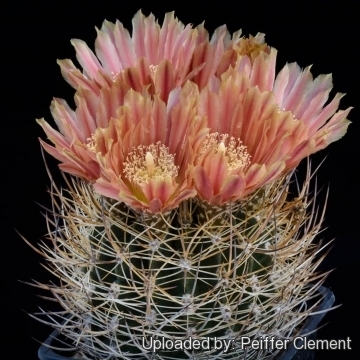 The distribution of this cactus overlaps with areas of high human density. It is therefore affected by land use change due to agriculture, mining, urbanization, desertification processes and illegal collection. 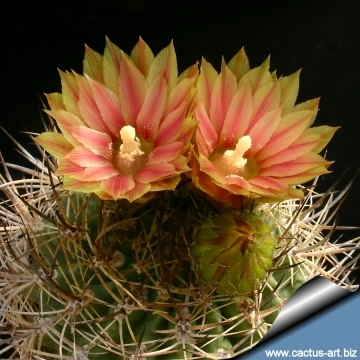 Description: Eriosyce curvispina is one of the most wide-spread of the Eriosyce species. It is also highly variable in appearance and has been received numerous, often unnecessary, names. In fact, there are a number of different looking varieties, but only some authorities recognize the different populations as segregate varieties. Three subspecies are recognized, the nominate form, subsp. armata (F.Ritter) Katt., and subsp. marksiana (F.Ritter) Ferryman. 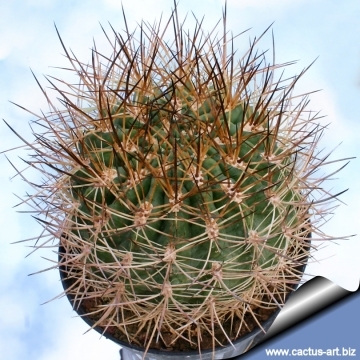 Habit: It is a solitary cactus that may occasionally form few branched clumps. Roots: Fibrous though sometimes developing short napiform root. 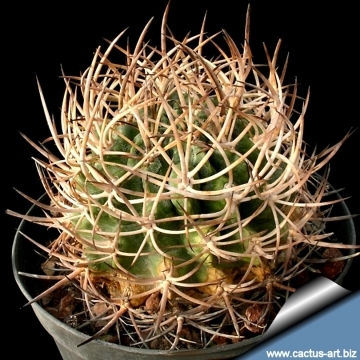 Stem: Subglobose or globose, sometime elongate (especially in cultivation), 8-20 cm across, greyish green, often with naked or with few spines at the top. Ribs: 14-24, noticeably notched with chin-like protrusions. Roots: Fibrous from a short tap root. 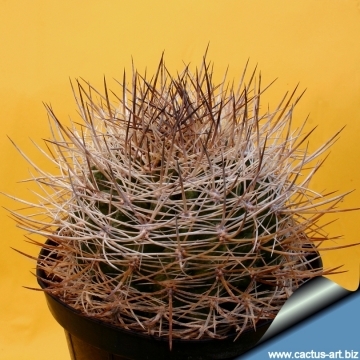 Spines: Long, stiff, greyish-brown spines with a darker tip, thin to thick, awl shaped. Young spines are almost black, while older ones turn greyish. Central spines: 4-8,20-30 mm long. Flowers: Flowers are about 3-5,5 cm long and broad, broadly funnel-form, yellowish-green, dull-yellow or yellow with reddish-brown mid-veins or reddish. Fruits: Somewhat elongate, reddish, fleshy, about 1 cm long splitting open by at the base. 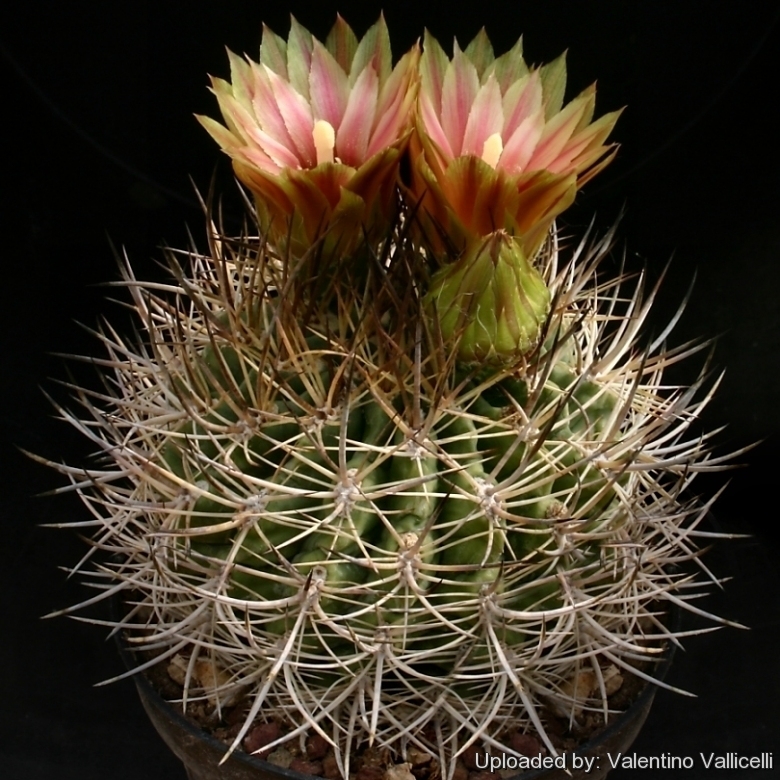 Remarks: The variety curvispina (sensu stricto) is always solitary, has large flowers up to 5,5 cm in diameter, strongly curved spines 20 or more mm long and is the more common and widespread of the varieties. 5) "Succulent Plant Research" Volume 1, David Hunt, Richmond 1994, page. 117. 8) "Memorie della Reale Accademia delle Scienze di Torino." Volume 37, Turin 1833, page. 76, Tab. 16. 9) Faundez, L., Guerrero, P., Saldivia, P. & Walter, H.E. 2013. Eriosyce curvispina. In: IUCN 2013. "IUCN Red List of Threatened Species." Version 2013.2. <www.iucnredlist.org>. Downloaded on 08 January 2014. 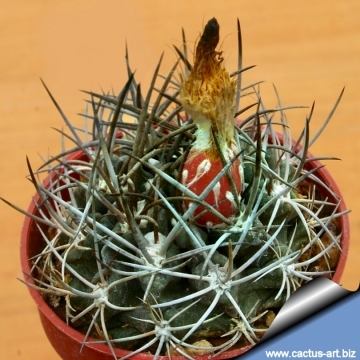 Soil: It requires a very fast draining drying open mineral, sandy-gritty cactus compost. Provide a very good drainage.